Gastric dilatation-volvulus (GDV) is a costly medical and surgical emergency condition that is fatal if untreated. Luckily, GDV is also a preventable condition. GDV occurs when the stomach distends with air and rotates along its axis, effectively shutting off any means of air, food and liquids getting into or out of the stomach. GDV is most commonly seen in large and giant breed dogs. The Great Dane, German Shepherd Dog, Standard Poodle, Weimaraner, Saint Bernard, Gordon and Irish Setters, and large mixed breed dogs are represented most commonly. 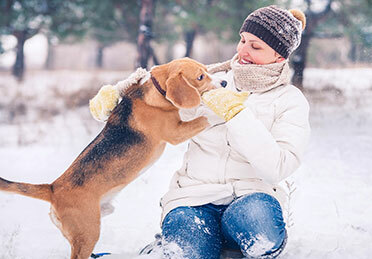 Predisposing factors that have been identified include advancing age, feeding types, patterns and habits, anatomical variations, underlying gastrointestinal disease, relatives with a history of GDV, and temperament. Feeding habits that have been shown to be associated with an increased risk of developing GDV include feeding a single type of food or food that has small particles, fast eating and swallowing large amounts of air, feeding once daily, feeding out of elevated bowls and feeding foods that have oil or fat among the first 4 ingredients. Anatomical variations shown to be associated with GDV include a deep narrow chest, being underweight, and weakness of the supporting ligaments of the stomach. Underlying gastrointestinal disease and alterations in motility have been suspected to also contribute to the development of GDV. Dogs with a first degree relative with a history of GDV and a fearful temperament have also been implicated as a predisposing factors, while dogs described by their owners as “happy” have been shown to have a decreased risk of GDV, possibly showing genetic and environmental factors in the etiology of GDV. Proposed precipitating factors of GDV include stress (recent kenneling and car rides) as well as seasonal and temperature variations. Mortality associated with GDV varies between 16%-33%. Early recognition and treatment are essential for a successful outcome. As the stomach becomes distended with air, it compresses the vena cava (the largest vein in the abdomen), resulting in lack of blood return to the heart and shock. Treatment of a GDV includes supportive care (IV fluids, pain medications) and early surgery to unrotate the stomach. In addition, a gastropexy is recommended to prevent the stomach from rotating again. 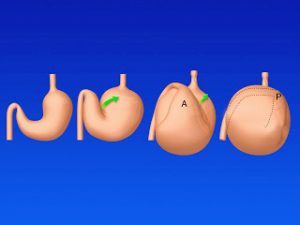 A gastropexy is a procedure where the stomach is permanently adhered to the right side of the body wall to prevent it from rotating again. A gastropexy is very effective, however not 100%. In addition, a gastropexy should prevent the stomach from rotating, but dogs may still bloat or become distended with gas. 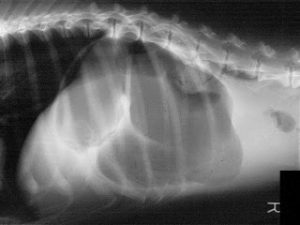 Radiographs may be needed to differentiate bloat from GDV and evaluation by a veterinarian is recommended if signs of bloat are noted.